- Slice the garlic. Place the butter in a pan, and fry the sliced garlic and the mushrooms in it. Use medium-high heat, and cook until the mushrooms start turning brown (takes about 5-10 minutes). If the garlic gets cooked before the mushrooms, gently remove it from the pan, then add it back when the mushrooms are ready. - Meanwhile, clean the kale, remove the stems, and cut or tear it into bit-size chunks. 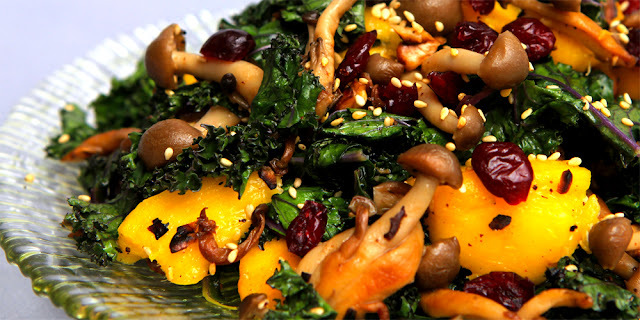 Once the mushrooms and garlic are cooked, add the kale. Stir and cook for a couple of minutes. - Add the dried cranberries and the mango chunks. Stir, and remove from heat. - Sprinkle sesame seeds all over the recipe. Serve warm. - There's already a beautiful mix of colors in this recipe. Place the dish on an interesting dish (either blue or some other color that nicely complements the colors in the dish, or with an interesting pattern, or both). Feel free to sprinkle some extra sesame seeds on top before placing the dish in front of the guests.